Explore the most popular places in Potsdam on this scenic hop-on hop-off bus tour. Visit many of Potsdam’s top attractions — like Sanssouci Palace, Cecilienhof, the Orangerie, Biosphäre Potsdam and Studio Babelsberg, to name a few. Select a 1-day pass, then board at any of the eight stops and get to know the city in custom fashion, with live on-board commentary in English and German. Audio guides in French, Spanish, Italian and Russian are also available. Visit top Potsdam attractions including Cecilienhof Palace and Sanssouci Palace, both UNESCO World Heritage Sites and Brandenburg Gate. Get to know the city of Potsdam and its top attractions in convenient and economical fashion on this entertaining and educational hop-on hop-off tour. It all begins with a hop-on, of course, at any of the eight stops. 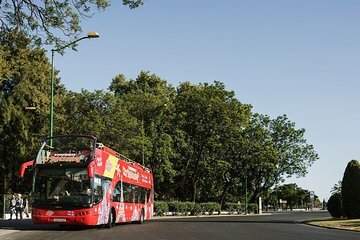 Board one of the red, open-top buses and enjoy the view with a live commentary of interesting facts and stories from an expert guide who knows the city inside and out. Learn about the history and happenings of Potsdam, the capital city of the German state of Brandenburg, as the bus rolls along from one location to the next. Hop-off at any of the attractions for a closer look, then hop back on when it’s convenient. Discover the historical city center, the Russian colony Alexandrowka and the Dutch Quarter, and visit popular palaces like Sansoucci Palace, one of the largest UNESCO World Heritage sites in Germany; New Palace, the largest and most impressive palace ensemble in Sanssouci; the small, neo-classical Charlottenhof Palace, also in Sanssouci Park; and Orangery Palace, built in the style of the High Renaissance and commissioned by King Frederick William IV. Also, visit the Cecilenhof Palace, where Churchill, Truman and Stalin wrote world history when discussing how to partition Germany. Hop off between the former East and West Berlin, on the Glienicke Bridge connecting Potsdam to Berlin, where Cold War spy exchanges routinely took place. Other top attractions include the jungle landscape of Biosphäre Potsdam, with over 20,000 beautiful plants, exotic animals and an hourly storm complete with thunder and lightning and Studio Babelsberg, the oldest large-scale film studio in the world. A sightseeing tour of Potsdam has never been easier — or more fun — than this hop-on hop-off bus tour of the city. Experience Potsdam in this unique way. Firstly, the content of the tour is great. The tour provides a great overview of the main highlights of Potsdam. Potsdam is a great pace to visit . 1. Confusion at the start as to which tour we should be on. 2. The group was mainly German so the guide spoke mainly in German which meant we were waiting around at each of the three stops to hear the very short English explanation. Potsdam was great but the tour on the bus was less than expected. The English audio tour did not match as we were driving past the sights. Would visit Potsdam again but on our own as we found the buses ended too early to see the Palaces properly. It was a nice tour. The guide was very helpful and gave us lots of information about the city. Although it is the size of a town, there are quite many things to see and the bus tour is the best way to do it. Fantastic way to see the gorgeous town of Potsdam. Definitely a highlight of our trip. This was a good bus tour. Our only regret is that we didn't allow more time to get off and visit the many interesting sites. Great way to see the sites and to get around Potsdam. Good English commentary. Be aware of the days the palaces are open. Potsdam is a must-see for any visitor to Berlin, and this is a very good way to get around to give you a sense of the stops you weant to make to spend more time at. This tour seems to stop at all the must-see palaces, and it's vert reasonably priced. The audio is very informative.